The following statements will give you detailed information on how your personal information and data will be dealt with on the part of NaturThermeTemplin (hereafter referred to as NTT). The protection of your data has the highest priority for us. NTT undertakes to protect the privacy of all those people who enlist our services and to treat the personal data as confidential. The basis for this are the statutory provisions prevailing at the time, such us the German Federal Data Protection Act (BDSG), the German Information and Communication Services Act (IuKDG) and the German Teleservices Data Protection Act (TDDSG). Cookies are used for the simpler handling of certain functions, (e.g. the shop function). However, they do not contain any personal data at all. The pages are designed in such a way that their use is enabled when the cookies are switched off. When using the pages, anonymous usage statistics are produced, which contribute to the improvement and demand-orientated design of our online presentation. The combining of personal data and usage statistics does not take place. When subscribing for a newsletter, we ask you to indicate your e-mail address. The details regarding the form of address and the name are optional, as we make it possible for you to receive the newsletter anonymously in accordance with § 6, Section 6 of the German Teleservices Data Protection Act (TDDSG). We would, however, be glad if you indicated your name in order to be in a position to address you specifically and in a polite way. If you contact us via the contact form or via the appointment booking arrangements, we ask you to enter your name and your e-mail address or your telephone number. This data is stored on our computers for further communication with you. But you will only receive e-mails or calls from us regarding your enquiry that you made to us. Your data will be deleted from our computers after this. Should you use the shop function of our pages, the data that you have entered is used on our computers for the processing of the order (e. g. dispatch via regular mail) and for customer care purposes within the meaning of the German Federal Data Protection Act BDSG. You will only receive information on products and news, if you have given your consent to this expressly and conclusively. You can have your data deleted at any time; please notify this to us by sending an e-mail to datenschutz@naturthermetemplin.de. We will not forward your personal data to third parties. Excluded from this are service partners (DPD, Deutsche Post AG) that require the transfer of data for the processing of orders. The extent of the data transferred is limited to the minimum necessary for the service. You will only receive e-mails from NTT. We do not publish any personal information of our users. 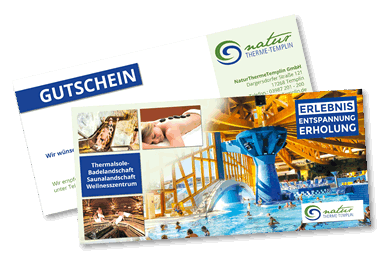 You can send an e-mail to datenschutz@naturthermetemplin.de at any time for the deletion of your user information. NTT undertakes to delete your personal data from the database as soon as you ask us to do so by telephone, fax, letter or e-mail. Should you have any queries or complaints regarding data protection on our pages, please address them to datenschutz@naturthermetemplin.de via e-mail.